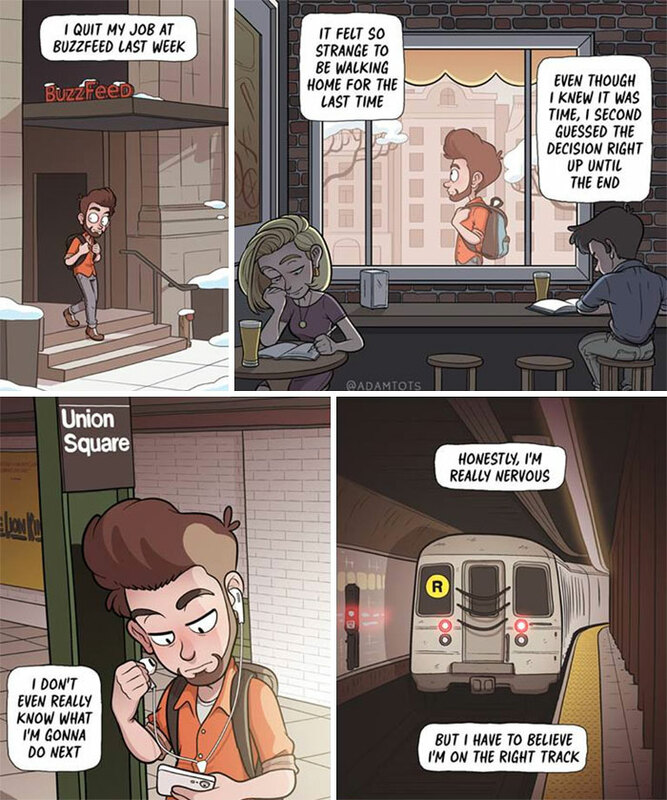 Cartoon artist Adam Ellis claims he left art school after a fellow student presented her final project to the class, declaring "I put a condom on the Virgin Mary," and the professor loved it. Fast forward in time, and now Ellis has just ended another chapter of his life. He left his corporate job at BuzzFeed to pursue his cartoonist dreams, fully concentrating on personal projects. His followers applauded Adam's decision to exchange security for freedom, and have been eagerly waiting for more and more of his funny comics ever since. Ellis has made a name for himself creating relatable and funny comic strips, and has even published Books Of Adam: The Blunder Years, a set of "hilarious trials and tribulations in attempt to become a functioning member of society." His collective Facebook, Instagram, and Twitter fan base exceeds 3M, making the author one of the most famous cartoonists on the internet. 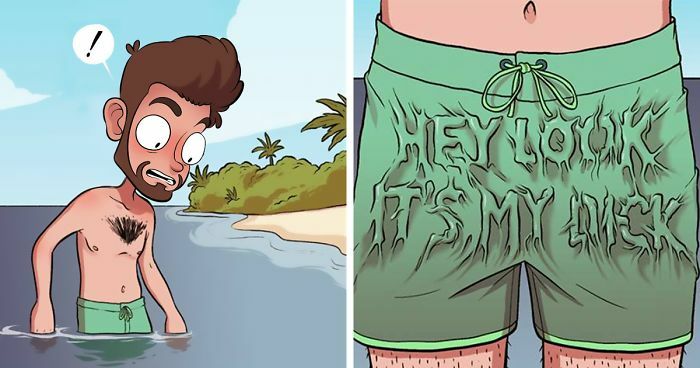 Scroll down to check out Adam Ellis' comics and upvote your favorites! I like the fresh perspective here. Good job. by far the most painful feeling in the world. This is literally my overgrown Great Dane. And they are always the one with sh*t taste. "you forgot....to leave the left one!" i drew a cartoon once that was this movie but from the point of view of new york. It's just a guy in a taxi waiting but then giving up when the ship never arrives. I called it 'Jack's Taxi'. I think the irony is more a case of if the trees had have been there still then they might have provided shelter from the wind. Omg yess that always happens! the devil has all the best songs, we all know that. I would love such a person. Like in Korea. It's the season of perfect legs everywhere. Shipping costs making sure you don't waste your money. "That's not what I ordered." This comic is funny on so many levels. Mixer taps are great because the water will be always the same temperature where you left it last time. I don't understand why those are not popular in all countries. I think this is my dad--and sometimes me. This has actually happened to me before when a friend gave me a 1 LB bag of Sour Patch Kids. The coarse sugar actually started working as sandpaper on my tongue and on the roof, but even finding that they were bleeding and the sour flavor was like a lemon in the wound, I did not COULD NOT stop, and finished the bag in immense pain. Drama is my favorite thing, when observed from a distance. How you "think"? How you HOPE! HAHAHAHA! This has happened to me more times than I can count. Those fruity bastards just sneak up on ya! Or vice versa. Me (with glittering shiny wide open eyes): "How do they DO that!?" The commentators: "Outrageous! What a mistake!" 2 of our dogs HATE fireworks. They are supposed to be illegal in our town, but it's never enforced.